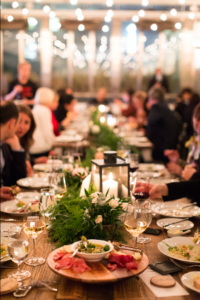 The purpose of this dinner event was to feature the bareMinerals and Buxom brands as part of a week long global conference being held for Shiseido Americas. 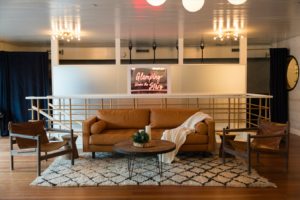 We hosted 80 global executives from the all over the world to come together to enjoy a relaxing atmosphere and much deserved break from a week full of presentations and meetings. The challenge? Seamlessly integrating two brands with completely different look and feels, together in a small venue. “Buxom is where bold, badass, statement makers and makeup risk takers, are stimulated, celebrated, and emulated. *” bareMinerals on the other hand, focuses on organic, simplistic products for women who care about their health and the environment. Two opposite twins. So, how do we mix the essence of beauty and nature with edgy, modern-luxury? 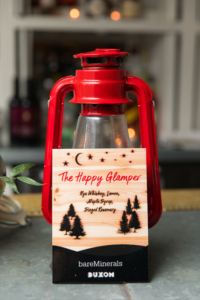 We took them “Glamping Under The Stars”. 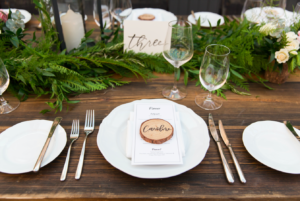 A BUXOM themed cocktail hour and bareMinerals styled dinner transported guests to a scene straight from the forest, with NYC’s stars twinkling above. 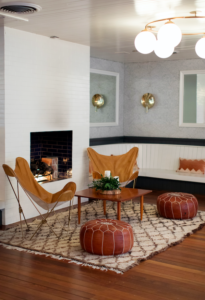 The layout at our venue, La Sirena, allowed us to create two scenes that worked cohesively- a fun cocktail hour “glampsite” and an elegant dinner space. 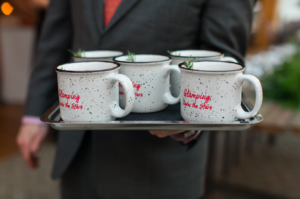 Guests kicked off exploring our “glampsite” around the fire enjoying speciality cocktails passed in custom campfire mugs, hand torched s’more bites, and other outdoor-themed passed hors d’oeuvres. Now the party’s really getting started- photo opp time! A forest-themed swingset was a big hit throughout the night for memorable pictures with colleagues and friends. 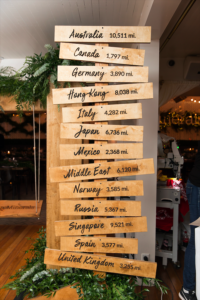 As part of the scene, we added a custom wooden directional sign that represented each country that guests traveled from and the miles away from NYC. From Singapore to the U.K., this statement sign was a special way to show how globally diverse this group really was. 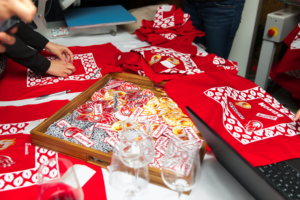 After posing for their close ups on the swings, attendees created custom BUXOM bandanas by applying patches of their choice including their signature #BUXOMBABE hashtag. If they chose to add their name, we offered custom live monogramming to stitch it in. Soft seating vignettes were set around the room which included brown leathers, repurposed wood, and camping style accents to tie the entire theme together. And yes, of course we had camping style chairs around a real fire. 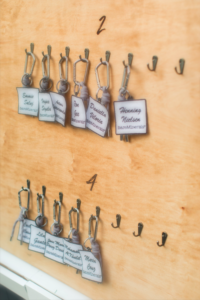 When it came time for dinner, guests found their names on custom stitched patches attached to carabiners that were hooked on wooden boards to direct guests to their assigned table. 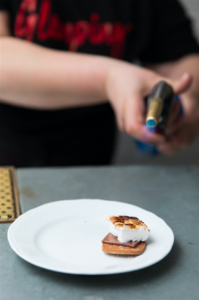 When they arrived at their seat, their name was hand calligraphed on an authentic wood slice atop a custom designed menu card for a special touch. 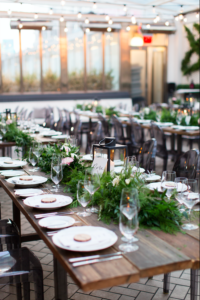 We set the scene of dinner in a lush forest setting, with lattice work greenery stretched across La Sirena’s gorgeous white statement wall. 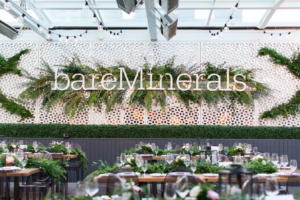 bareMinerals attendees had no doubt they were in the right place when seeing the 15 foot acrylic logo with delicate fairy lighting and abundant greenery stretched across the wall. Gazing upwards, Edison bulb lighting strung along the glass ceiling that revealed the clear NYC sky to make them feel like they were truly glamping.